Think about times you have been in the outdoors; it sometimes feels like you are the first person to experience your pristine surroundings, the first person to soak in the beauty of the trees and hear the flowing creek. Then think about other times, where you hiked in miles to a remote destination, only to find garbage and destruction. Obviously, the first experience is preferable; this is why SAHC decided to teach a Leave No Trace Trainer Course this spring! 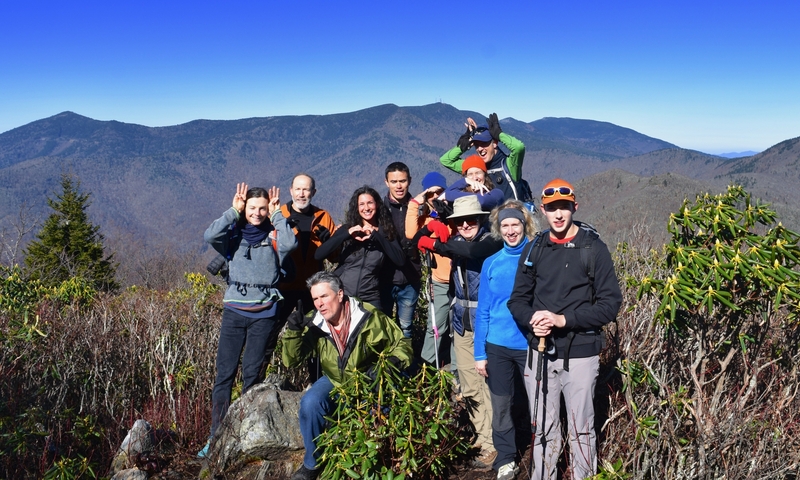 We were able to do so with help from the Appalachian Trail Conservancy. 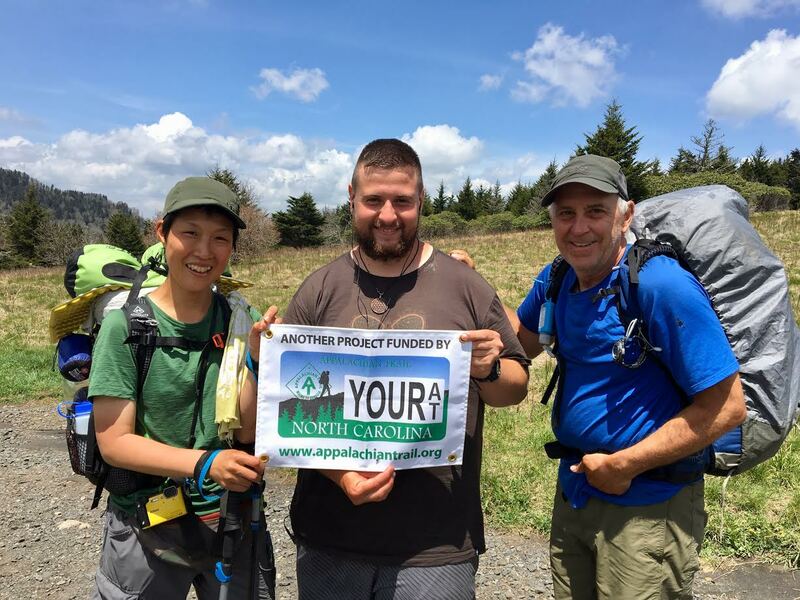 The ATC sponsors a grant annually using funds from the Appalachian Trail specialty license plates. Leave No Trace is a set of outdoor ethics that promote conservation and help to minimize recreation-related impacts in the outdoors. There are seven principles that are used to educate and guide recreationists in sustainable minimum impact practices that mitigate or eliminate human impacts in the outdoors. 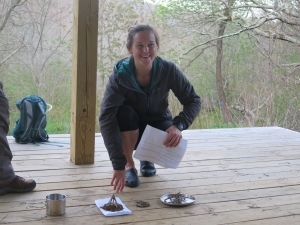 The Leave No Trace Trainer Course was a free, two day certification course. The participants on the course learned how to be effective LNT trainers, so that they can continue to educate others on best practices! The course was taught at SAHC’s Elk Hollow Property. Participants arrived on Thursday morning and had a day full of education. The instructors, Michelle and Emily, taught lessons on LNT History, teaching techniques, and the Plan Ahead and Prepare ethic. Then it was time for students to break up into pairs. Each pair picked out two ethics that they would like to teach, and we’re given the resources that they needed to teach them. Throughout the rest of the course, it was up to the students to teach the other 6 ethics. This led to some awesome group discussions, fun games, and overall great information! On Thursday the group brought teaching to the trail, they woke up at 4:30am and hiked up to Little Hump to catch the sunrise and eat breakfast. After breakfast the group continued on the AT to the summit of Hump Mountain. Along the way we stopped to teach LNT lessons and to discuss different LNT observations made along the trail. By seeing and experiencing impacts on trail the group was able to make connections that may not have been possible in a classroom. The participants are all avid users of the outdoors, but still felt they learned new ways to reduce their impacts. Some realized that they need to walk further from streams to use the bathroom; while others we’re shocked about the amount of time it actually takes for an orange peel to fully break down (up to two years). Thank you again to the Appalachian Trail Conservancy for providing this opportunity! These participants will continue to be good stewards of the outdoors and the AT, by passing on the knowledge they gained from this course! 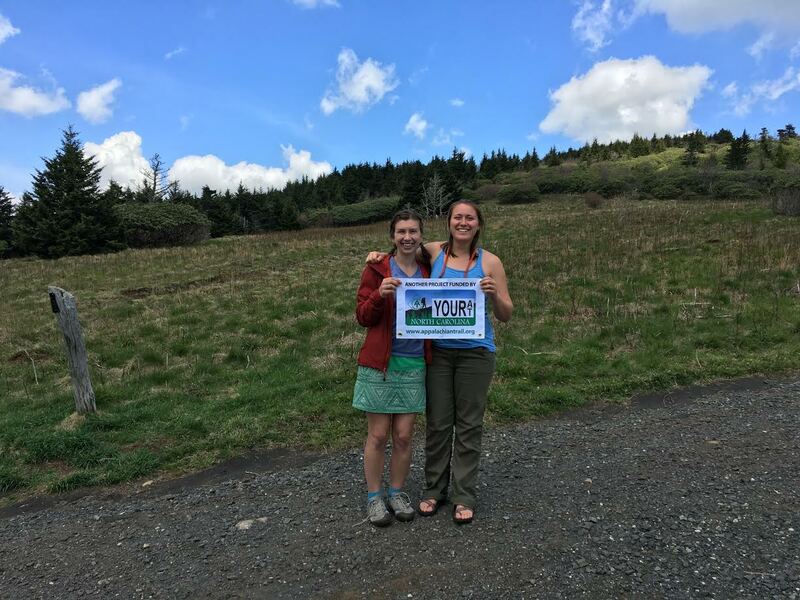 The second part of the grant we we’re given was to conduct Leave No Trace outreach on the Appalachian Trail at a popular junction! On Friday a group went up to Carver’s Gap to table, and talk to hikers about potential impacts and specific Appalachian Trail LNT practices. Over the course of the day we talked to over 60 people about Leave No Trace on the Appalachian Trail. A big topic that came up was the shortcuts between Carver’s Gap and Grassy Ridge. Many people did not know that using those shortcuts can cause major degradation on the balds including erosion and damaging sensitive habitats. After that conversation with many hikers, many decided they would no longer use these shortcuts. Although this outreach event only lasted one day, we hope the hikers we reached will continue to share this knowledge and start the conversation with others to help us preserve these special places! Despite a rainy day, the 2017 Bookwalter Binge Gran Fondo was a huge success, with about 200 cyclists enjoying the ride! SAHC staff helped cheer on riders and hosted an exciting raffle at Pisgah Brewing for the Binge after-party. Our Land Protection Director, Michelle Pugliese, rode in the Medio in costume as Wonder Woman. While on the 62 mile ride she was able to point out SAHC conservation easements to other competitors. To view the race results, visit: BookwalterBinge.com. From proceeds of the raffle, we raised almost $2,000 for land and water conservation in the mountains of NC and TN. 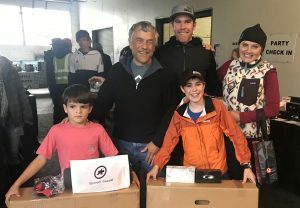 Thank you to everyone who participated in and supported Southern Appalachian Highlands Conservancy through the Bookwalter Binge Gran Fondo, and a special thanks to Brent and Jamie Bookwalter for choosing SAHC as the charity for the Binge! 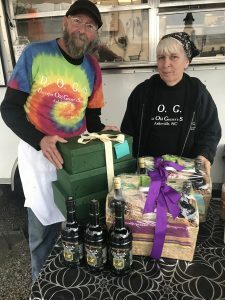 If you were not able to pick up your prize on Sunday, you can pick it up weekdays from 9:00am to 5:00pm at our office, located at 372 Merrimon Ave. Asheville, NC 28801. 3. Weekend Rental House in Asheville- #741820 – Please email emily@appalachian.org to claim your prize! 20. Velocio Clothing Gift Card- #741801 – Please email emily@appalachian.org to claim your prize! 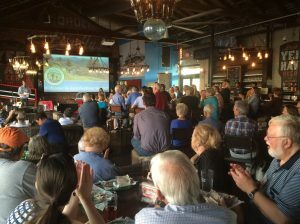 We had a wonderful time with all of our members, friends, and guests last night at Yee-Haw Brewing Company in Johnson City, TN. Congratulations to our new/returning Trustees — David Erwin, Rick Manske, John Mason, Laura McCue, and Cynthia Poortenga. Thank you to our outgoing Trustees — Courtney Blossman, Jack Hamilton, Bill Lowndes, and Kathy Singleton — for your years of dedicated service to land and water conservation on behalf of Southern Appalachian Highlands Conservancy. Congratulations to Kirk Watson of Causeway Interactive, the recipient of our 2017 Stanley A. Murray Award for Volunteer Service, and a big thank you to all our sponsors and raffle item donors for helping make our event a resounding success. It was a wonderful night for our annual Appalachian Spring conservation celebration, benefit, and member event. Thank you to our Land Trust Day sponsoring businesses, for helping us raise $13,000 for conservation in one day! We’d also like to give a special THANK YOU to Mast General Store, for allowing us space in the Asheville and Waynesville stores to provide informative materials and talk to customers throughout the day. And thank you to our staff and volunteers who hosted tables at the Mast General Store locations: Michelle Pugliese, Sarah Sheeran, Caitlin Edenfield, Joan Worth, Leigh DeForth, and Cheryl Fowler. This year, we also hosted two area hikes during Land Trust Day. Our Project Conserve AmeriCorps Land Protection Associate, Caitlin Edenfield, joined Community Farm and Food Assistant Yael Girard at Farm Aid 2014 near Raleigh this year! https://appalachian.org/wp-content/uploads/2016/02/10608491_10152670898941352_2143835467641210278_o.jpg 598 446 sahcadmin /wp-content/uploads/2016/03/southern-appalachian-highlands-conservancy.png sahcadmin2014-10-30 11:48:322016-10-20 17:48:15SAHC at Farm Aid 2014! It was hot – but not too hot – just the kind of bright summer sun you imagine plants loving to soak in.